The property was located in around 20km north of Tel Aviv. 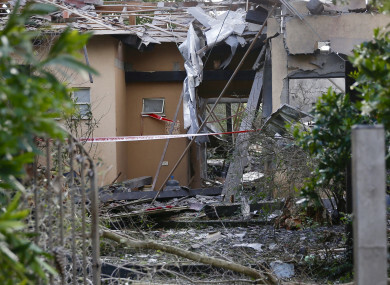 SEVEN PEOPLE HAVE been injured after a rocket fired from the Gaza Strip hit a house in near Tel Aviv in Israel earlier this morning. The property was located in the community of Mishmeret, around 20 kilometres north of Tel Aviv, police said, and was completely destroyed. Israel’s army said the rocket was fired from the area run by Hamas. A hospital treating the wounded said seven Israelis were lightly injured by burns and shrapnel, and included four adults and three children. Mishmeret is more than 80 kilometres from the Gaza Strip, and rocket fire from the Palestinian enclave at that distance is rare. The incident risks escalating tensions between the sides ahead of next month’s Israeli elections. Israeli prime minister Benjamin Netanyahu announced that he would cut short a visit to the United States following the attack, after a meeting with President Donald Trump later today. Israel also closed its people and goods crossings with the blockaded Gaza Strip and reduced the zone in the Mediterranean it allows for Palestinian fishermen off the enclave. Netanyahu said called the rocket fire was “a criminal attack on the state of Israel” and that it would be met with more force. although it is understood that Hamas leaders have gone underground. The group’s chief in Gaza, Yehiya Sinwar, is believed to have cancelled a scheduled public speech in the wake of the rocket fire. Netanyahu is believed by many analysts to want to avoid another war in the Gaza Strip – which would be the fourth since 2008 – with unpredictable results ahead of the elections. But he faces a tough challenge from a centrist political alliance led by former military chief Benny Gantz, and he will come under heavy political pressure to react firmly. “The reality in which Hamas turned Israel into a hostage is unprecedented and unfathomable,” Gantz wrote on Twitter on Monday. No damage or injuries were caused, but Israel responded to further rocket fire earlier this month by hitting what it said were around 100 Hamas targets across the Gaza Strip. Both Hamas and its ally Islamic Jihad denied they were behind the rocket fire on towards Tel Aviv 14 March, raising the possibility that they were launched by fringe groups. Israel’s military said the 14 March rockets were launched by Hamas, but media reports in Israel later said that the army’s preliminary assessment was that they had been fired by mistake during maintenance work. The reports were a sign that Israel was seeking to calm tensions, and the military refused to comment on the reports at the time. The latest rocket strike comes days ahead of the one-year anniversary of Palestinian protests and clashes along the Gaza Strip’s border with Israel. Netanyahu’s visit to the United States was expected to include Trump’s formal recognition of Israeli sovereignty over the Golan Heights. Breaking with longstanding international consensus, Trump said last week that the United States should recognise Israeli sovereignty over the area it seized from Syria in the Six-Day War in 1967. With reporting from - © AFP 2019 and Associated Press. Email “Israel vows to respond 'with force' after seven injured by rocket fired from Gaza Strip”. Feedback on “Israel vows to respond 'with force' after seven injured by rocket fired from Gaza Strip”.